Being able to surprise my babies on Tuesday morning made all the torment I had felt on the way home simply disappear. Their beaming smiles and their tight hugs made me realise that I'd done the right thing and left me wondering how I could have questioned myself. The whole reason for my being there was to take Osh to school for his first day in the Junior Department. This is a huge milestone in any child's life and I could not miss my son's big day. thought to - but when you've not been able to do simple things for your kids you appreciate them more. I made him pose for the obligatory First Day Photo and sent it to Mark in London so he could show Martha Grace her Big Brother looking smart for school. Everyone knew before the end of last term that I was pregnant, you can't really hide a bump in summer when you're not wearing many layers. I was worried about being approached by the other Mothers asking where my baby was and then falling to pieces in front of them all explaining the situation. So I drafted in a friend to be my chaperone. Luckily I stayed calm and didn't get upset, I kept reminding myself that Martha had just had a great weekend of recovering and that she was doing well. The bell rang and Osh ran off to join the line for his class. But not before giving Mammi a huge hug and a kiss. As they started walking single file in to the school building he turned around and shouted to me "I Love you Mammi". Then I knew it - I had done the right.thing. Martha wouldn't know that I wasn't with her on Tuesday 3rd September 2013, she had her Daddy and her Nainy and a team of Doctors and Nurses. 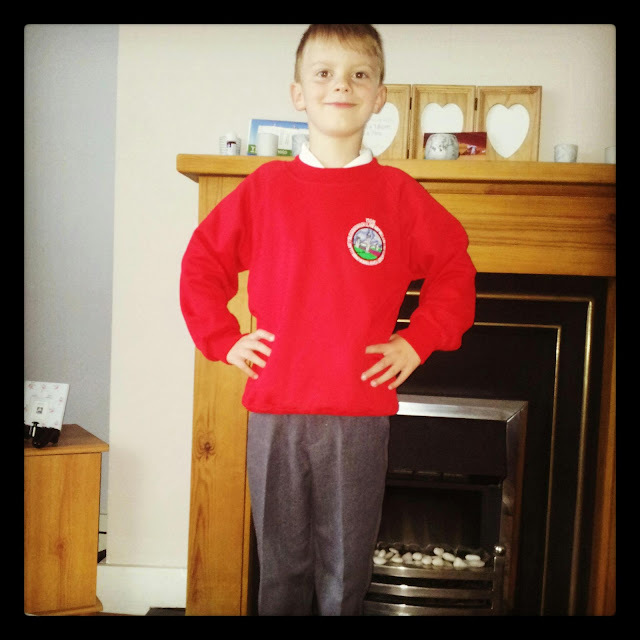 But Osian would have felt my absence if I hadn't have come back to take him to school on the first day of the new term.